Indianapolis can still win a third straight AFC South title. Really, it can. All it needs is to win and then have the Texans, Bengals, Chargers, Jets, Saints, Chiefs, Patriots and Browns all lose. The league will throw in the partridge in a pear tree. If the Colts win and the Houston Texans lose, both would be 8-8, and the first four tiebreakers for deciding which team makes the playoffs – record against one another, record against divisional opponents, record against common opponents, and record within the conference – would not be enough to decide who makes the cut. It then comes down to strength of victory and strength of schedule. And for things to play out in the Colts’ favor, a lot of things have to go their way. Sure, going 9 for 9 here looks dim, but long shots come in every once in a while. Are the Colts’ odds as good as that horse’s? Seems not. or, more precisely, about 4,311-to-1. That’s more than a long shot; that’s an extended-to-an-unfathomable-distance shot. John Urschel is an offensive lineman for the Baltimore Ravens and admits, “I love hitting people.” As it turns out, he loves hitting the books, too. He earned a masters degree in mathematics from Penn State, and he recently published a paper with the impressive title A Cascadic Multigrid Algorithm for Computing the Fiedler Vector of Graph Laplacians in the Journal for Computational Mathematics. Note that Urschel was the lead author, even though his three co-authors were an associate math professor from Tufts and two math professors from Penn State. I have to wonder if the paper was fairly refereed. I mean, honestly, who in the math community is gonna tell a 6’3″, 308‑pound football player that he made an error? I drive a used hatchback Nissan Versa and live on less than $25k a year. It’s not because I’m frugal or trying to save for some big purchase, it’s because the things I love the most in this world (reading math, doing research, playing chess) are very, very inexpensive. There are 1,596 players in the National Football League at any given time (32 teams with 53 players each). Throw in a few more who serve on practice squads and occasionally get a chance when someone else gets hurt, so maybe that number climbs to 2,000. Still, the chance of making it to the NFL is unbelievably remote. Recruit 757 claims that only 0.008% of all high school athletes get drafted by the NFL. And if you can believe Wolfram Alpha, there are 2,770 mathematicians in the United States, or approximately 1/47,165 of the U.S. workforce. Point is, the probability of becoming either a professional football player or a mathematician is ridiculously small. Becoming both is smaller still. Though John Urschel proved it’s greater than 0. The saving grace is that he seems like a down-to-earth guy who realizes how lucky he is. 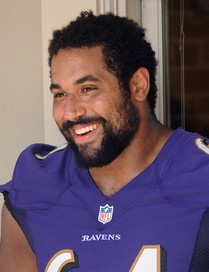 To read a math article written by John Urschel, check out 1 in 600 Billion. Yeah, that’s right. I’m as smart as Greg McElroy, and I’m smarter than Blaine Gabbert. Based on Wonderlic scores, anyway. I scored a 43, so I guess that means I’m smarter than Phil Simms, too. The Wonderlic test has been administered to NFL players since the 1970’s, and Phil Simms scored the lowest of all Super Bowl quarterbacks who have taken the test. He led the New York Giants to victory in Super Bowl XXI, but he only got a 10 (out of 50). A score of 10 indicates that a person is literate, but “that’s about all we can say,” according to Charles Wonderlic, Jr. And to think that Phil’s words will be heard by 100 million people when he announces Super Bowl XLVII on Feburary 3. Ever wonder which NFL players are intellectually inferior to you? You can find out by taking the mini-Wonderlic test at www.nicholascreative.com/footballiq. And I sure wish you would. Since conducting “research” for my Smart Quarterbacks post two years ago, I’ve been somewhat obsessed by the idea that the Wonderlic — a 12‑minute, 50‑question test — will someday unseat the SAT — an onerous, expensive, 5‑hour ordeal consisting of 10 sections — as the entrance exam for college. In my wildest fantasies, I envision a world with no entrance exams. Not without reason, mind you. It’s just that the SAT is better at measuring natural intelligence than predicting college success. Then again, so is the Wonderlic. But the Wonderlic takes only 4% as long to complete, so high school students wouldn’t have to sacrifice an entire morning to complete it. To prove my point, I attempted to gather SAT scores, Wonderlic scores, and college GPAs for a handful of NFL players, and this data has supported my hypothesis — that the Wonderlic test is just as accurate as the SAT at predicting college success (which is to say, it is equally abysmal). But the sample size is far too small to be reliable. Data. I need more data. Data, data, data. If you’re willing, please enter your SAT (or ACT) score, your college GPA, and your Wonderlic score in the form below. (If you can’t see the form below, try this Google form.) All of this data will be held confidential. I will only use it to conduct an analysis. You probably remember your SAT or ACT score and your college GPA. But you probably don’t know your Wonderlic score, because most people have never taken the Wonderlic test. you can take the mini-Wonderlic at www.nicholascreative.com/footballiq to get a fair approximation of your Wonderlic score. Thanks in advance for your help. I’ll collect data through Wednesday, January 30, and I’ll post my analysis before kick-off on Super Bowl Sunday. 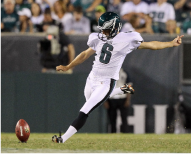 Tonight’s Eagles-Panthers game had several mathematical incidents. You want me to describe playing on Monday night in one word? Prime time. Computer scientists start counting at 0. Apparently pro football players start counting at 2. Speaking of counting… did you notice that the sentence above had three hyphenated words? That’s just crazy. During the opening kick-off, Mike Tirico mentioned that the Carolina Panthers lost the coin toss. That alone is not exceptional, but it was the eleventh straight game that they had lost the flip. The odds of a team being that unlucky? How about 2,047 to 1? Perhaps they can blame bad luck for their eight losses this season, too. Wide receiver Steve Smith of the Panthers caught a pass in the first half that took him to 745 career receptions for a total of 11,011 yards. What a cool number! First, it’s a palindrome. Second, 110112 = 2710, and he currently ranks 27th among wide receivers in career receiving yards. That’s a pretty fun coincidence. The NFL made a seven-year proposal that offered increases of between 5 percent and 11 percent in wages per year. First-year officials who made an average of $78,000 in 2011 would earn more than $165,000 by the end of the new agreement. A 10-year veteran in 2011 who made $139,000 would get more than $200,000 in 2018. [League spokesman Greg] Aiello said the NFL also offered a retirement arrangement under which each official would receive annual contributions starting at $16,500 and increasing to almost $23,000, plus a wide range of investment opportunities and expanded reimbursement for medical insurance costs. Remember that these guys only work 16 days a year. According to the Bureau of Labor Statistics, the average K-12 teacher makes $52,000 to $55,000 a year. That’s for 180 days of work, not to mention late nights grading papers and weekends preparing lessons for the coming week. If any teachers want to tell these guys that they already make too much, you can voice your opinion at www.canyoubelievetheypaymetoblowawhistle.com. One of the most exciting plays in the history of professional (American) football was the opening play of the second half of Super Bowl XLIV, when the New Orleans Saints recovered an onside kick. They then scored to take a 13–10 lead, and eventually won the game 31–17. What’re you gonna do, flip a coin three times in a row? You gotta get heads three times in a row to get an onside kick? Once again, probability was placed front-and-center in recent football discussions. While I like Schlereth’s new, less violent, and more mathematical approach to onside kicks, I just wish he had gotten the math right. Flip two coins. Two heads results in a successful onside kick. Then the probability would be 25%, closer to the current reality. Kicking team indicates to referee that they will try an onside kick. Of course, this must be done secretly, so as not to arouse the suspision of the receiving team. I propose that one referee be assigned to each team; the team would encode the message using RSA encryption, and the assigned referee would be given the corresponding RSA numbers. A message can then be passed without fear of interception by the receiving team. To ensure that this procedure does not signficantly delay the game, messages stating “we WILL try an onside kick” and “we WILL NOT try an onside kick” could be prepared in advance, and unemployed math PhD’s could be hired as NFL referees to decode the messages. The receiving team must similarly indicate whether or not they suspect an onside kick. Flip 9 coins. If 9, 8, 3, or 1 of them land heads, the onside kick is successful. Flip 9 coins. If 9, 8, 5, 4, or 2 of them land heads, the onside kick is successful. Flip 9 coins, just so the receiving team is unaware of what the kicking team decided to do, which will allow for the element of surprise with future kicks. If the NFL decides to accept Mark Schlereth’s suggestion for using coins to determine onside kicks, I am hopeful that they will give my proposal serious consideration. If necessary, I have an Excel spreadsheet that I would be willing to share with them. This weekend, when the Pittsburgh Steelers take on the Green Bay Packers in Super Bowl XLV, it’ll be a match-up pitting a very smart quarterback against, well, a guy who’s not exactly the sharpest knife in the drawer. If you’re like most of the world, you probably don’t perceive Ben Roethlisberger to be very smart. He attended Miami University, but information about what he studied is considerably harder to find, and few would call him intelligent. After all, he rides his motorcycle without a helmet, frequently fraternizes with underage co‑eds, and associates with people who occasionally urinate in public. So it will come as no surprise that Roethlisberger scored lower on the Wonderlic test — the 50‑question, 12‑minute exam administered by the National Football League to measure the problem-solving ability of players who will enter the draft — than Aaron Rodgers. So, does this mean that Rodgers has an advantage in Sunday’s game? Not necessarily. Below is data from the last ten Super Bowls. The winning quarterback is listed first, and his Wonderlic score is given in parentheses. (Sorry, I couldn’t locate the Wonderlic score of Brad Johnson.) But for the other nine games, the team whose quarterback had a higher Wonderlic score won four times, the team whose quarterback had a lower Wonderlic score won four times, and last year, the two quarterbacks had the same score. As it turns out, the average Wonderlic score of an NFL player is 20, while the average score of an NFL quarterback is 24. Only one Super Bowl quarterback in the past ten years had a Wonderlic score below the league average. That was Donovan McNabb (14) in 2005. So while a higher Wonderlic score may not imply Super Bowl success, it does seem that quarterbacks who make it to the Super Bowl have above average scores. Of course, a football team has more than just one player, so it might be more informative to look at the Wonderlic scores for every player on a team. Sadly, I don’t have that kind of time, but such an analysis was done at least once. The Denver Broncos defeated the Green Bay Packers in Super Bowl XXXII; the average Wonderlic score for the Broncos was 20.4, while the average score for the Packers was 19.6. The Wonderlic test fascinates me. While it may not be the best predictor of success in the NFL, many companies use it to assess prospective employees’ problem-solving abilities. And it got me to thinking — if the Wonderlic test is adequate to predict job success, could it also be used to predict college success? Consequently, I sought to answer the following question: Could the Wonderlic test be as good a predictor of college success as the SAT? Woman in Registrar’s Office at University of Virginia: Hello. Me: Uh, good afternoon, ma’am. I’m trying to locate the GPA and SAT scores of one of your former students. Woman: Whose information are you looking for, sir? Woman: Are you related to Mr. Schaub? Woman: Are you a prospective employer? Woman: So… why do you need Mr. Schaub’s information? Me: The Wonderlic test. It’s a test they give to professional football players to determine their problem‑solving ability. Woman: Hold on — Mr. Schaub is a professional football player? Me: Yes, ma’am. He played quarterback for the University of Virginia from 1999 to 2003, and now he plays for the Houston Texans. Woman: So, why do you need Mr. Schaub’s GPA and SAT scores? Me: Well, I’m trying to determine if the Wonderlic test could be used as a predictor of college success. I need Mr. Schaub’s GPA and SAT scores to see if the Wonderlic test was as accurate as the SAT in predicting how well he did in college. Woman: Well, I can’t just go around giving out information about former students to total strangers. Me: Yes, I understand, ma’am, but I’m not going to publicize the information. I just want to analyze it. Woman: And what will you do with your analysis? Me: Well, I was planning to post the results on my blog. Woman: So, you write a sports blog? Me: Well, no, ma’am. It’s actually a math blog. Woman: A math blog that focuses on sports? Woman: Then what kind of math blog is it? Me: Well, actually, it’s a blog about math jokes. Several other calls met a similar fate. Consequently, I only have Wonderlic, GPA and SAT scores for six players. But, whatever. Let’s roll with it and see what happens. The three numbers for each player are shown below. There’s not a very strong correlation between SAT and GPA. But here’s the thing: the correlation between SAT and GPA for this set of six football players isn’t that much worse than the correlation between SAT and GPA reported in Validity of the SAT for Predicting First-year College Grade Point Average, a study of 151,316 students at 726 four‑year institutions undertaken by the College Board; in that study, r = 0.29. There’s not a very strong correlation between Wonderlic and GPA, either, but it’s stronger than the correlation between SAT and GPA for the six football players above and for the 151,316 students in the College Board study. There is, however, a very strong correlation between Wonderlic and SAT, which is perhaps just another way of saying that both tests are equally lousy at predicting college success. and, the grades of college football players may be artificially inflated. Still, I think I’m onto something here. Wouldn’t it be great if we could replace the four‑hour SAT with the 12‑minute Wonderlic test? The marketing of it would be easy. For school administrators, simply tout a stronger correlation to college success than the SAT, and mention significantly lower costs. For students, simply state, “You can finish the Wonderlic in 5% of the time it takes to complete the SAT! You won’t have to give up your entire Saturday!” Now, wouldn’t that be grand?